Why Do We Translate The Urantia Book? And yet, the result is a magnificent collection of 196 papers, delivered in perfect English, reflecting a richness and accuracy of vocabulary, and an impeccable mastery of grammar and syntax making the text fluid and even poetic in places without ever appearing heavy or incomprehensible. What a piece of art! Unfortunately, the revelators were content with using only the English language. What a pity they did not produce the revelation in all of the major languages of Urantia. Instead, they charged the Trustees of Urantia Foundation with the responsibility to carry on with the job as it is stated in the Foundation’s Declaration of Trust. Translations of The Urantia Book into the major tongues of Urantia are indispensable to the spreading of the revelation. In the distant future, Urantia will have a common language for all nations, but for the moment, we are far from this ideal. This is why Urantia Foundation publishes translations: To give every nation the opportunity to be exposed to the teachings of the revelation. All translations must be faithful to the original, for the dissemination of unfaithful or falsified translations would be fatal to the integration of the teachings into the religious cultures of the peoples of Urantia. Translation is a science as well as an art. The difficulty lies in translating the authors’ thinking, using a creative choice of terms and syntax without straying, to produce a text that is faithful and enjoyable to read. The revelatory nature of the text within The Urantia Book adds another layer of difficulty. Not only must the translator understand the concepts and ideas—this is the common intellectual process in translating—but he has to be a sincere truthseeker and believe in the revelatory content of the revelation in order to be sensitive to the Spirit of Truth and to the revelatory mechanism of the Thought Adjuster. Hence a professional translator can only be called upon if he or she is an ardent believer in the revelation. In early 1956, a man named Jacques Weiss received The Urantia Book through Mrs. Caroline Brown, a member of the Forum, whom he had met in New York soon after the end of World War II. Weiss had already translated several books on spiritual subjects, such as Life and Teaching of the Masters of the Far East by Baird T. Spalding, Esoteric Healing by Alice A. Bailey, and others. (In one of his letters to Urantia Foundation he stated that translating spiritual content had prepared him for the task of his life: translating The Urantia Book.) After having read the book, he contacted the Foundation in December 1956, and obtained permission to translate it into French. The translation was published in 1960 and 1961, in three volumes under the name La Cosmogonie d’Urantia. According to the great majority of French-speaking readers, not only was the quality of the French language fluid, beautiful, and pleasant to read, the translation was outstanding. However, as early as 1964 to 1965, some bilingual French readers contacted Weiss and told him of translation errors. After many difficulties between Weiss and the Foundation, a team of three readers formed under the aegis of Henry Begemann, then field representative of the Brotherhood, and undertook a correction of the translation starting in 1978. Over twenty thousand changes were made, ranging from commas to omitted or mistranslated words to the rewriting of entire sentences. This correction was completed in 1994, and the first “revised and corrected” edition was published. It was formatted in a single column and had the same pagination as the original English text. About twenty years later, in 2012, a second revision was initiated to correct misspellings and punctuation errors, and to make other minor changes. The second “revised and corrected” edition was published in 2014, again with the same pagination as the English text. Editing or revising a translation can take as long as making a new translation, and sometimes even longer. Back in 1978, it made sense to the original revision team to correct the existing French translation instead of producing a new one. This would avoid the inevitable confusion of having two different texts, which could lead to conflicts and division among the French readership. Wisdom must dictate our conduct—it is the price to pay for the long-term unity of our communities. This cycle to complete the French translation took approximately forty years, and it was necessary to attain the high quality and faithful French translation that is in print today. The Urantia Book has two distinct elements: the content and the container. The content includes the authors’ ideas, concepts, supernal teachings, and terminology. The container includes the authors’ style, grammar, syntax, punctuation, and typography. An ancient proverb says in vino veritas (in wine, the truth). The Urantia Book is like a glass of wine. The wine (the content) is exceedingly tasty, and the glass (the container) is made of the finest crystal; together they make a piece of art. An ideal translation must do two things: First, it must convey faithfully the content of the original text so that it is technically accurate with consistent terminology. Second, its style must creatively and fluidly reflect the beauty of the original; this is, in part, subject to the personal talent of the translator and to the appreciation by the readers. The reality is that you can translate an English phrase in multiple ways in the target language, while still being entirely faithful to the original. A translation being a human effort, the wine metaphor immediately raises the problem in a very concrete way: How faithful is the translation of the content? How beautiful is the translation of the container? There are nine possible ways in which a translation can be categorized, combining three levels of each. In the first of these nine combinations, the translation of the content is excellent, and the translation of the container is beautiful. In the last, the translation of the content is not good, and the translation of the container is ugly. In others, we see various combinations of excellent, mediocre, and unacceptable. Of course this illustration serves only as a rough model for understanding and evaluating the quality of a translation. While there is an infinity of nuances in each category that cannot be shown in the grid, using it gives us the advantage of understanding the quality of a translation. I believe that every reader would choose No. 1, and this is the goal of Urantia Foundation. But is it an attainable goal? How do we achieve excellence in translating The Urantia Book? 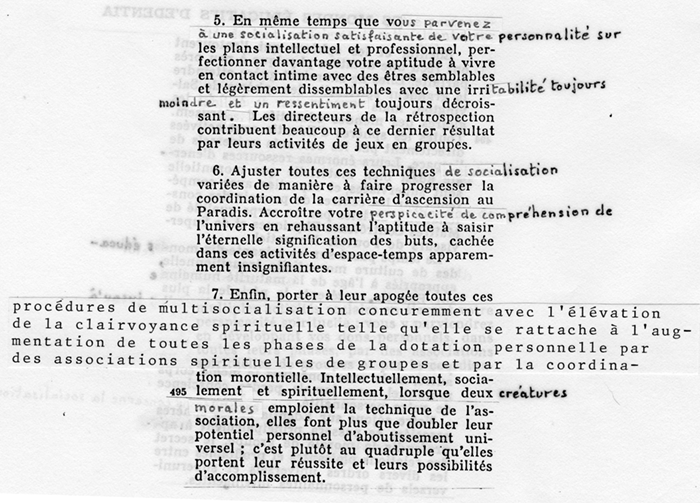 The example of the French translation illustrates the empirical method, which has been improved and refined over the years to become the Foundation’s methodology for producing and revising translations. Based on thirty years of experience, good and bad, Urantia Foundation has put into place a framework—which includes a methodology as well as a set of guidelines, procedures, and means for quality control—that guarantees, in the end, a quality translation. 1. Preparation (1 to 10 years): As the English text of The Urantia Book finds its way around the world, its teachings will inspire a reader to translate it into their own mother tongue. An extraordinary process of self-discovery takes place in the mind of a truth seeker, and the desire to share this “pearl of great price” motivates him or her to translate, at first for themselves, then for their fellow countrymen. When this occurs, it signals the potential for a new translation to emerge. ⚫ A chief translator/team that is qualified to translate the book (the translator must satisfy Urantia Foundation’s criteria) and who is committed to this lengthy process. ⚫ The need for resources to support the translation (e.g., a secure translator website that provides specific tools, financial support if needed, support from a project manager, and access to a translator discussion list). ⚫ A signed contract or agreement between a translator and Urantia Foundation that provides the rights and responsibilities of each in publishing a quality translation. 3. Translating (9 to10 years): The translator partners with Urantia Foundation to create a high-quality translation and prepare it to be published. ⚫ The translation of term lists and specific names included in The Urantia Book for consistency. Since 2016, Urantia Foundation has supported the translators (or revisers) with computer-assisted translation (CAT) software, which includes memory tools. ⚫ The preparation of monthly reports by the translator for the translation manager. ⚫ A process for correcting and polishing a translation or revision to make sure that its content and container are of a high quality. A third-party professional evaluation, from time to time, to ensure faithfulness and quality of language. 4. 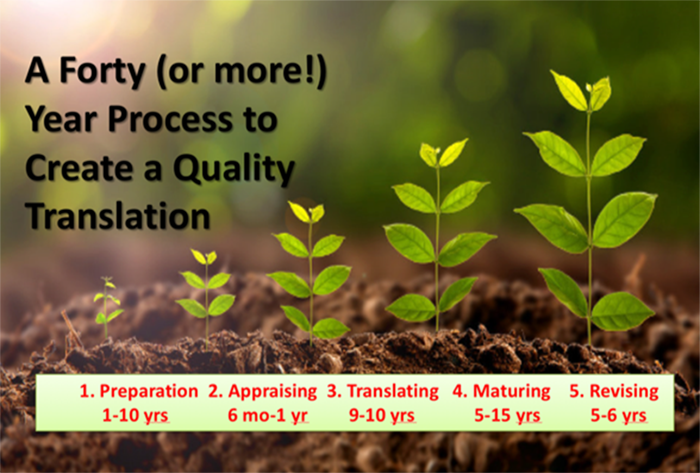 Maturing (5 to 15 years): The translation is distributed to solicit feedback from different sources with the future goal of improving the translation. In the case of the French translation, it took eighteen years before this phase was complete. 5. Revising (5 to 6 years): The translation is revised. Feedback has been received, and a team of dedicated readers has emerged. Terms are clarified, quality is improved, and the text is forensically scrutinized and polished. ⚫ Creation of a team of longtime readers, working with the translator (when possible), who revise the text using specific criteria provided by Urantia Foundation. ⚫ Creation of a reader group to comment on the revised papers. ⚫ Evaluation by third-party professional translators, from time to time, to ensure faithfulness and quality of language. ⚫ Final review of the fluidity, syntax, grammar, punctuation, and typography, which is usually conducted by the chief translator who is working with a professional copyeditor. ⚫ Evaluation of the final product by two or three professional translators to obtain a more objective evaluation. This phase ends as plans are made to reintegrate the enhanced translation into the thought stream of individuals and cultures. The English-speaking readership benefits from reading The Urantia Book in their native language, avoiding the need to choose from several texts translated from the same supernal source. There are no other “English translations.” Imagine what would have happened if the Urantia midwayers were not united and instead had published two different versions of Part IV? How would the planetary government react? We are told to create thousands of study groups: How confusing would it be for participants to read from two or three English texts using different terminology and different proper names. It would provoke endless discussions, great confusion, and division instead of focusing on the content. This situation would be seriously detrimental to the unity and brotherhood of the readership. Or, let’s suppose the revelation had been originally given in French and translated into two or three different English translations by competing French organizations. How would one react? What is the Result of Multiple Translations in One Language? ⚫ How can readers come together with different translations in study groups and study efficiently? ⚫ How can readers cooperate and be united in spreading the teachings when they are so divided? ⚫ How can groups of readers become attractive and welcome new people? ⚫ What negative image of the revelation does this offer to the world when a community of readers is so divided? Translating The Urantia Book is far from a common endeavor, with its goal to convey the revelation faithfully and ultimately advance the intellectual and spiritual level on Urantia. The purpose of the revelators’ work is nothing less than to expand our cosmic consciousness and enhance our spiritual perception. That is why the top priority of a translation must be absolute fidelity to the content and the spirit of the teachings presented by the revelators. The work of the original translator is therefore essential in the sense that he or she becomes a bridge to the revelation. In most cases, the first translation must be considered an approximation, which will be improved as longtime readers forensically scrutinize the meanings of words, study how it conveys the concepts, and make suggestions for changes. Since it is a team effort, the ultimate rendering will be objectively more exact and closer to the original, without becoming a literal word-for-word translation. In addition, using the services of a copyeditor to verify the quality of grammar, syntax, and style will ensure that readers are in possession of a high-quality text. Urantia Foundation is wholeheartedly committed to producing and publishing translations of the highest possible true-to-the-original quality because of its mandate and responsibility. Our methodology, which is based on experience, is designed to bring each translation to a higher level of accuracy and readability. The trustees hope that those interested in helping to improve translations or to translate the book into languages for which there is no other translation will consider partnering with the Foundation in a spirit of cooperation.